A Hartford, New York, barn was carefully dismantled for reuse this fall by Green Mountain Timber Framers. I was there and later analysed the timber frame. Dan McKeen, owner of Green Mountain TF asked me to write a guest blog on the geometry of the barn for his website. I wrote about the basic layout, how it was developed from just one dimension, the width of the barn. Here are two more diagrams that continue the exploration of the geometry. The section is the measured drawing of the end of the barn seen above. I found that the mortises in all the posts (the mortises hold the tendons of the rails) were all cut in the same pattern. The arc the framer used to locate the intermediate lefthand post also located the upper horizontal rail. 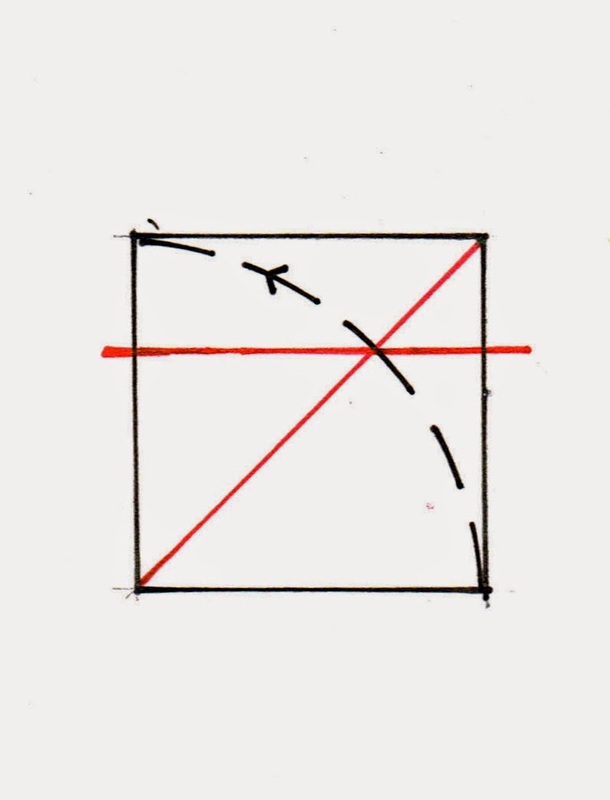 The diagonal intersecting the arc of the length of the square can be easily rotated so that it marks a horizontal line instead of a vertical one. All the rails for the barn are located at the same heights on the posts. This means the framer could set up one jig to cut all the mortises - simplifying his job, getting the work done faster. And a bit of mass production, ie: a precursor to square rule framing. There is also the roof layout. I have not yet drawn the diagrams. Be awestruck with me! Full of wonder!